Once on 28, you will see a sign for the Kisatchie National Forest, then for Kincaid and Valentine Recreation areas. Both of these have trails. Review: Great trail, slow to drain, though. This is a tough one to ride after lots of heavy rain, hence the trail condition rating on this day. Review: WAT is a rugged singletrack with some short uphills that are tough because of tall roots ,some technical downhill and lots of fun on this trail.WAT also has several creek crossings with bridges and other low lying areas that are very muddy after rain. The trail has yellow diamond marking it. Review: Had a great time. It really is beautiful out here. The trail is easily marked with yellow diamonds. Can't wait to return. Review: In my personal opinion, this is a great ride for beginners on up, as I have been there a few times. There are some good climbs (considering its Louisiana), and some pretty fun downhills. The only precaution I can make is that you make sure they aren't planning a controlled burn when you take your trip there. A few friends and myself went and tried to ride and had a wall of smoke consume us, even though they were burning on the other end of the park. Needless to say, we only rode about a mile and had to turn back. Review: Just rode 81 miles on the Wild Azalea trail. I rode from Valentine lake to Woodworth. Besides the few down trees on the back half of the trail, the trail was well tamed. All the underbrush was recently burnt. The hills roll with roots, but that's the challenge. Who would want an easy trail? Expect to get off your bike at some point, be it mud, down trees, sliding out on pine straw, or the unknown. Perfect trail to benchmark your ride and gear. You will be able to pick out your weaknesses if your ride the 24 and back. Review: If you're looking for one continuous trail that you can put in a lot of miles on, this is the one. I would recommend pairing sections of this trail along with the Kincaid trails. The LA XC Series uses a small portion of this trail along with the West Lake Loop for their annual "Sasquatch Stampede". The section from Valentine Lake to the Evangeline Camp gets traveled the most and sees the most trail maintenance. The southern end starting in Woodworth is a nice ride as well as long as the trees are cleared. I would recommend waiting for a dry spell before attempting the whole trail. The section from Twin Bridges Rd to the Castor Plunge crossing is low lying and can be extremely muddy during the rainy season. There is no water available so come prepared. There are several road crossings where water can be easily staged for a long ride. Some earlier reviews talk of roots and other poor riding conditions. This is a very rideable trail that has a lot to offer. If you are a beginner, know that you will push you bike up a few hills and will look to avoid a few root sections. But as you get better, you'll find that these sections become your favorite part of the trail. Review: Nice Scenery. Fun downhills at times, But TONS of roots. It made the uphills almost unclimbable. We rode the part of Wild Azalea from the trailhead by Valentine Lake back to the highway that runs in between Valentine and Lake Kincaid about 5 miles in length then took asphalt back to trailhead. I really like this area but trails needs alot of work to be "fun". Review: Ride was very easy. Nothing challenging about the ride, but it exceeded my expectations of a trail in central LA. Gentle rolling mounds (too small to be called hills). Lots of dense foliage right near the trail, overgrowing the trail in some spots. However, trail was clearly marked on trees every few dozen meters. Difficult to build up any speed due to vegetation blocking my ability to see ahead. Lots of surprises when foliage camouflages a relatively steep incline/decline, bridge, or hairpin turn. Small trees fallen onto the trail. All things considered, this was a good ride. Bring lots of water with you, I finished my 3 liter in the 90 minutes I was riding. Safety gear (gloves, sunglasses, and helmet) kept me protected from a LOT of sharp vines and tree branches. Review: I loved this trail, rolling single track that goes for miles. My riding buddies and I would travel 40 minutes just to get to this trail. We never completed the whole trail, we developed our loop, riding the asphalt rode back to our vehicles. 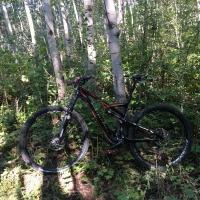 Review: I am fairly new to mountainbiking but in good shape from years of running. 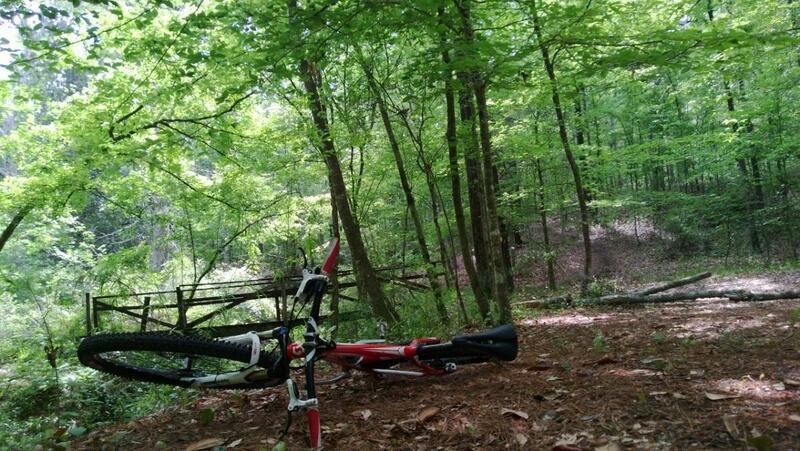 I have ridden a few trails before but nothing like wild azalea. We began at Valentine Lake and road to the Wild Azalea spur and back. This section of the trail was demanding...especially on the way back to Valentine...probably because I was pretty tired. Downhills were great but I only wish they lasted as long as the uphills. Had I known what I know now I would have tried other segments as this one was difficult for a newcomer to the sport. Look forward to riding other segments soon and improving my abilities. Wild Azalea Trail MTB Trail 4.13 out of 5 based on 16 ratings. 16 user reviews.